Cockroaches are one of the oldest and most primitive of insects. They flourished during the Carboniferous period of the earth's history, 350 to 320 million years ago, which has been nicknamed "The Age of Cockroaches" by paleontologists. The fossil evidence uncovered indicates that during this time, cockroaches made up about 40 percent of the world's insect population. Cockroaches from 340 million years ago looked much like roaches living today. Cockroaches have a flattened, oval body, long, slender antennae, and a shiny black or brown exoskeleton. Most species also have wings that are held flat over the back. The exoskeleton, or shell, is made of chitin, which is about as thick as a human hair. The chitin covers the roach's entire body, even its eyes. Cockroaches range fromabout 0.5 to 2 inches in length, with the largest being found in the tropics. They have grasshopper-like mouth parts for chewing and feed on plants or animal matter, including dead insects and bedbugs or even cardboard, paper, books, glue, and other manufactured products. They are nocturnal insects and are rarely active or visible during the day. They live and hide in warm, damp, dark places, coming out at night to hunt for food. 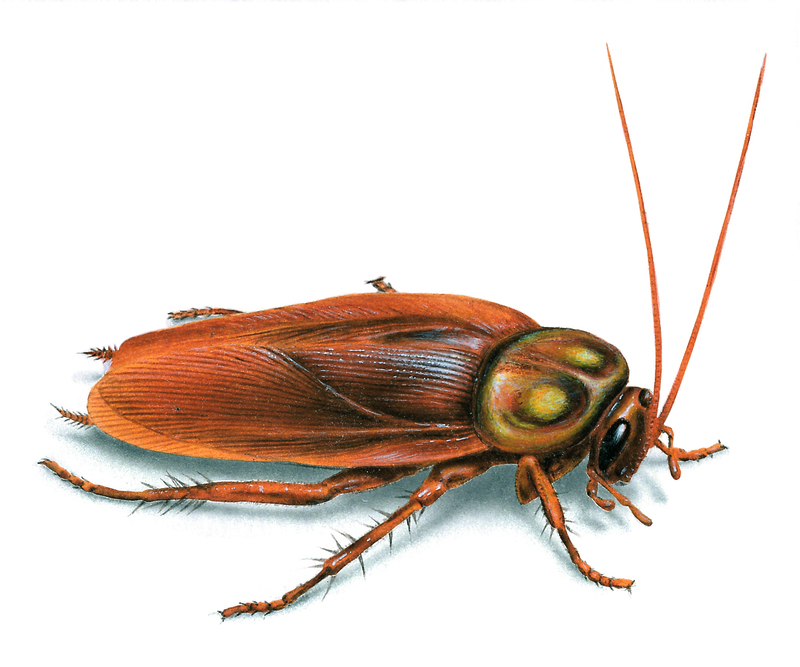 The cockroach has three life stages: egg, nymph, and adult. Cockroach eggs are deposited in groups in a leathery case or capsule, the ootheca. There may be from thirty to forty-eight eggs in the capsules of some species, while others have only ten to twenty-eight. The newly hatched nymphs have no wings and shed their skins (molt) several times before becoming winged adults. Indoor roaches generally have several generations of young per year, but outdoor species may require a full year to develop from egg to adult. The German cockroach, Blatella germanica, also called the "water bug" in some places, is found throughout the world. It is commonly carried home in paper grocery bags and boxes (where it hides because it loves the taste of glue) and also likes to live around water pipes. Though it has only a 150-day life span, one adult female can produce as many as eight egg capsules, each filled with up to forty eggs. Thus, a female can produce more than 3,200 young in its lifetime. According to a bulletin from the U.S. Food and Drug Administration, one female could be the source of over ten million females in a single year, and over ten billion females in 1.5 years, assuming that all the babies survived and reproduced and food supplies were adequate. 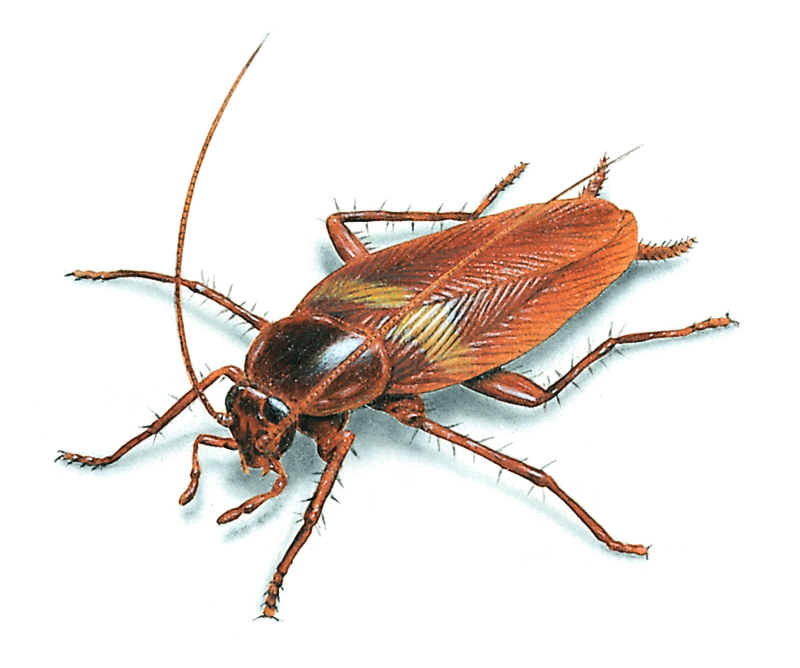 The German roach is relatively small in size, about one-half inch long, compared to some of its Asian relatives. 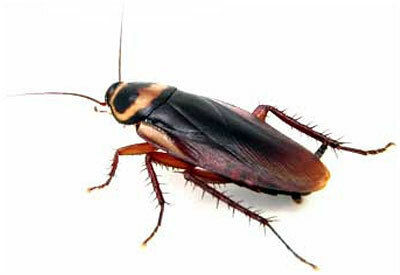 The Asiatic (or oriental) cockroach, Blatta orientalis, can be up to two inches in length and is considered one of the dirtiest household pests. It is oval in shape, with a shiny black exoskeleton. Males have short wings and can fly, unlike females, who have only vestigial wings. This species is found throughout the world, having been carried almost everywhere by ships, trucks, railroad cars, and airplanes. The American cockroach, Periplaneta americana, is found in most warm climates throughout the world. It prefers to live indoors and is found in basements and furnace rooms. It has a life span of about 1.5 years and lays about sixteen eggs every forty-five days. It originally came from Central and South American rain forests. The American roach has a set of wings that enable it to fly long distances. The American and German species are cannibals. Young nymphs eat their own kind if there is not enough food available. Mothers frequently eat their own egg capsules if food shortages develop. 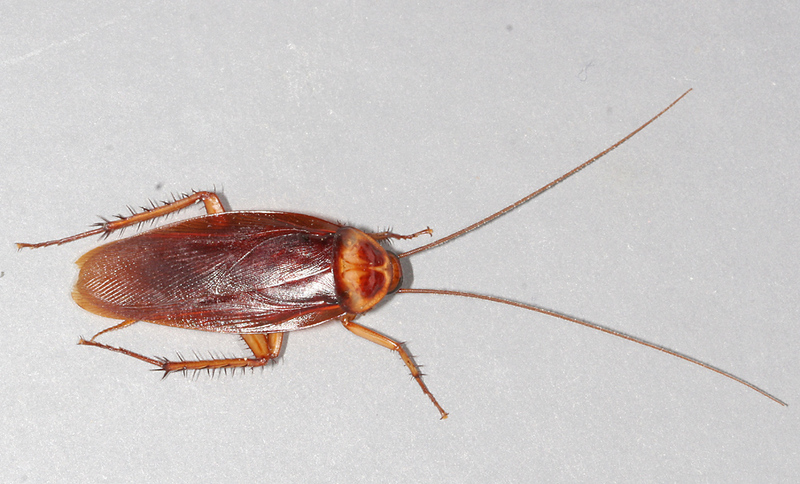 However, roaches can survive for more than a month without water or food. This feature has consequences for the food industry-for instance, roaches accidentally sealed in shipping crates can survive fairly comfortably even if shipped long distances with extremely limited resources. Cockroaches are found in the desert as well as the forest. Desert roaches, Arenivaga investigata, burrow under the sand during the hottest part of the day, coming out to feed only at night. They can absorb water merely by sticking out their tongues. The brown-hooded wood cockroach, Cryptocercus punctulatus, lives in decaying logs in the forest along the Atlantic coast. Only three other species of this genus survive, one in China, one in Russia, and one in the western United States, because the forest habitat in which it thrives is disappearing. 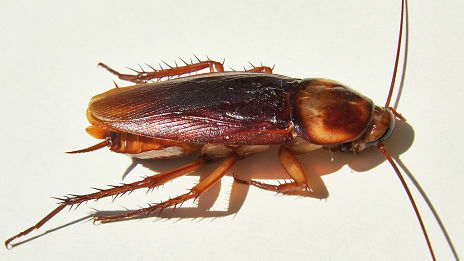 The common wood cockroach, Parcolblatta pennsylvanica, on the other hand, is found in abundance under logs and stones in northern forests. This species eats wood, which it digests with the help of bacteria living in its stomach, and is not considered a household pest. 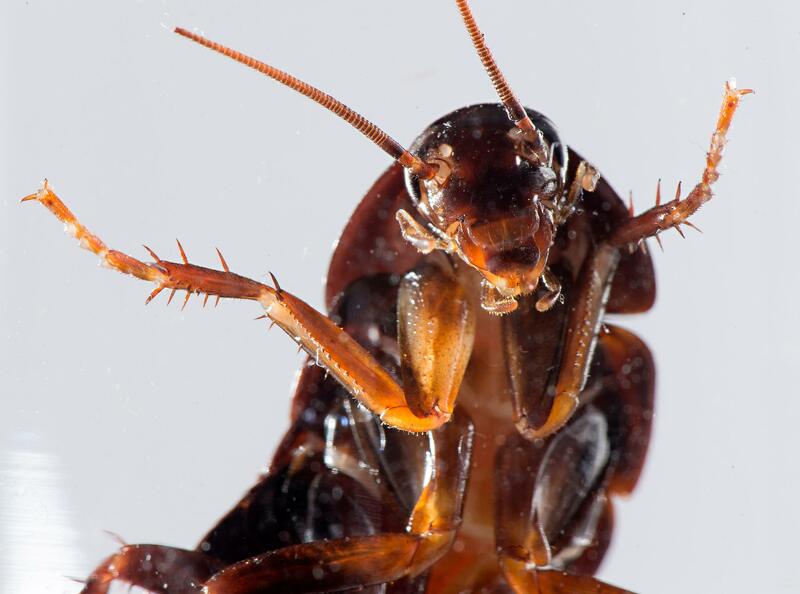 Closing spaces and cracks around pipes, doorframes, and baseboards can prevent cockroach infestations. 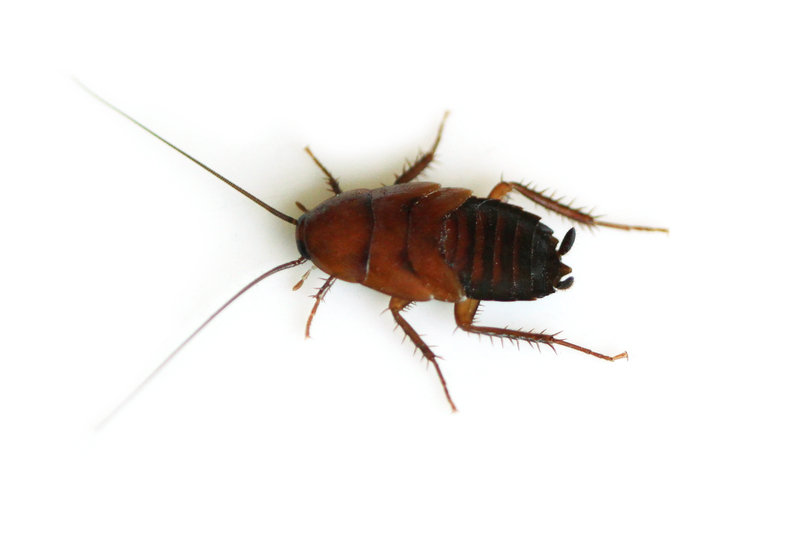 Paper bags and cardboard boxes should be inspected for roaches when they are brought into the home. Store food in containers with tight fitting lids. Pet food should be served by placing the bowl in a second, shallow bowl filled with soapy water. Roaches cannot swim across this barrier. Leaking water attracts roaches, so plumbing leaks should be fixed quickly. Sink and bathtub drains without stoppers are also inviting homes for roaches. Garbage cans should have lids and be emptied frequently. 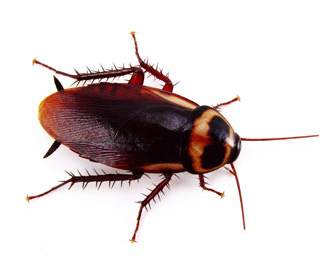 Cool temperatures can also kill roaches; few survive temperatures below freezing.